The Russian T-10 aka IS-10 Heavy Tank was the final of the IS series and aka The IS-8. It was pressed into service as a replacement to the other IS tanks, thou its numbers didn’t match those of the rest of the series as the T-55 was in production, of which had an almost equal firepower and protection. However it was the introduction of the Main Battle Tank that saw the demise of the heavy tank, which in Russian service was the T-64. The biggest differences from its direct ancestor, the IS-3, were a longer hull, seven pairs of road wheels instead of six, a larger turret mounting a new gun with fume extractor, an improved diesel engine, and increased armour. General performance was similar, although the T-10 could carry more ammunition. T-10A – (1956) modification, adding a single-plane gun stabilizer. T-10B – (1957) adding a 2-plane gun stabilizer. T-10M – (1957) improved version with longer M-62-T2 L/43 gun with five-baffle muzzle brake, 2-plane gun stabilizer, machine guns replaced with 14.5 mm KPVT (a better ballistic match for the new main gun), infrared night vision equipment, NBC protection. Overall length is 10.29 m.
1963 – T-10Ms are equipped with OPVT deep-wading snorkel. 1967 – T-10Ms are supplied with APDS and HEAT ammunition. The T-10 is known to have been exported to Egypt and Syria. 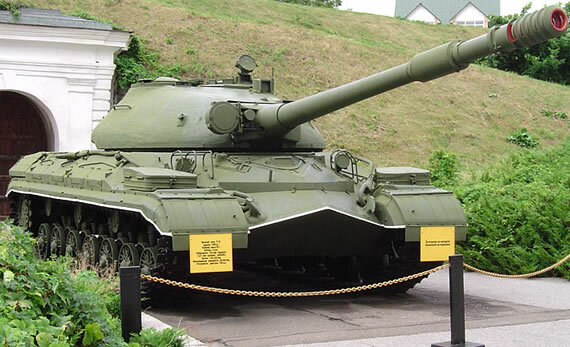 It was used in combat during the 1973 October War, where it normally provided long-range fire support to the T-55/T-62 tanks, with little success. Heavy tanks were withdrawn from Soviet front-line service by 1967, and completely removed from service in 1993.